This has happened since SSI bought out VO. They have for some odd reason integrated VO's profiling questions before the survey into their OO platform. Which is a pain in the backside as every single day it asks those questions. I click their email solicitations for surveys and if I get profiling, I close the tab (for Opinion Outpost). I am tired of it too. And that survey link I clicked was nothing to do with shopping. It was entertainment. Notice on the right that scrollbar? The list was huge. 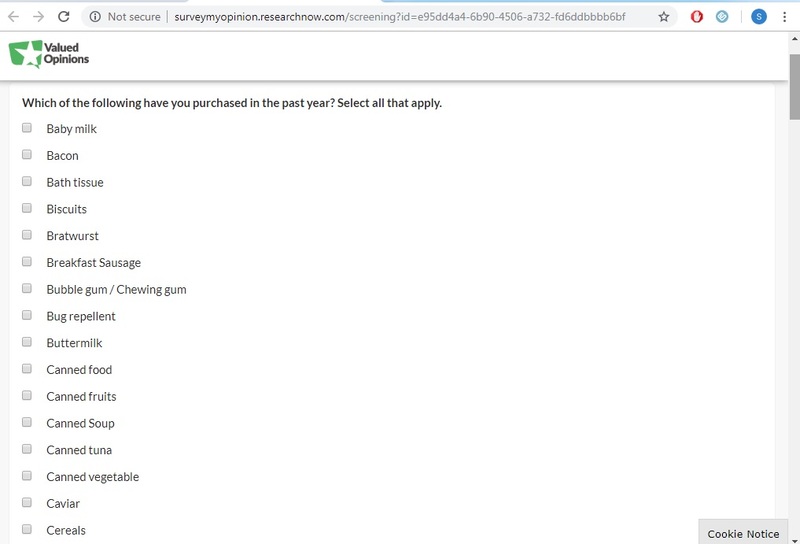 Why should I spend 10 mins of my time ticking each relevant answer when it was an entertainment survey I clicked, so these pre-screening questions have absolutely no bearing on weather I qualify or not. I had to close it off as I cant be bothered. Hopefully tomorrow it doesn't ask the same questions. These questions IMO have nothing to do with pre-survey profiling. Rather OO maintains a database of their users to sell/show to third parties to show that their users have certain characteristics that client companies/survey companies are looking for. They need a blockchain for this. Also, an encrypted profile for each user that all the survey routers could access to totally avoid DQs. It is a mess for a lot of these. Unfortunately some survey platforms are not coded correctly for this to work. Such as Ugam or Harrispoll. Their surveys are notorious for DQing people later on as survey quota is full. It should simply DQ someone right away without getting them to a certain point in the survey. It isn't the case of the survey quota being filled while someone is doing a survey, it's frequently at a exact point in the survey it will DQ someone because quota is filled. So quota checks clearly aren't being done until that point in that survey, where they have already harvested a lot of "free" data.